Zenberu is the chieftain of the Dragon Tusk Tribe. He has the appearance of a humanoid crocodile. He is quite tall, exceeding 2.3 meters when standing, which makes him rival in height with the fifth Floor Guardian Cocytus. His body covered by several scars gives the impression that he is a veteran to battle. His most bizarre feature is his asymmetrical arms. Similar in trait with a fiddler crab, his right arm is especially thicker and more muscular compared to his left. His left arm's ring finger and pinky are completely gone. On his chest is the traveler insignia burned in the form of a two-headed snake. Zenberu is quite blunt and to the point in a verbal conversation. Having no need for formalities and niceties of diplomacy, he seems to favor strength and duels to solve disputes. When he talks, his teeth clash together, making it difficult to discern whether he is being casual or threatening. In battle, he is calm and collective, preferring to wait out his opponent and then strike. While he is considered a battle maniac, he always honors his promises with friends and foes alike. He leads the Dragon Tusk lizardmen tribe. Every few years, the patriarch is chosen through a test of strength within the tribe and Zenberu has proven himself to be the strongest within the Dragon Tusk Tribe. 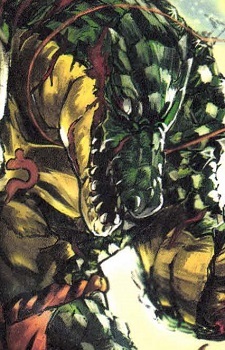 He is a unique figure in lizardmen culture, as in the past he was originally a traveler like Zaryusu. Before the resource war in the Wetlands, Zenberu once fought the chief of the Sharp Edge Tribe and was defeated. This defeat encouraged him to become a traveler so he can see new sights and get stronger. During his travels in the mountains, he encountered a dwarf and formed an amiable relationship. Before the two parted ways, the dwarf bequeathed Zenberu his steel halberd. Zenberu then return to the Wetlands and managed to be accepted back into his tribe. Despite his past as a traveler, he managed to rise to the top of the tribal hierarchy, no doubt using his new-found strength and experience from his travels. He was later killed in a battle against Cocytus but was then revived by Ainz by the request of Zaryusu.